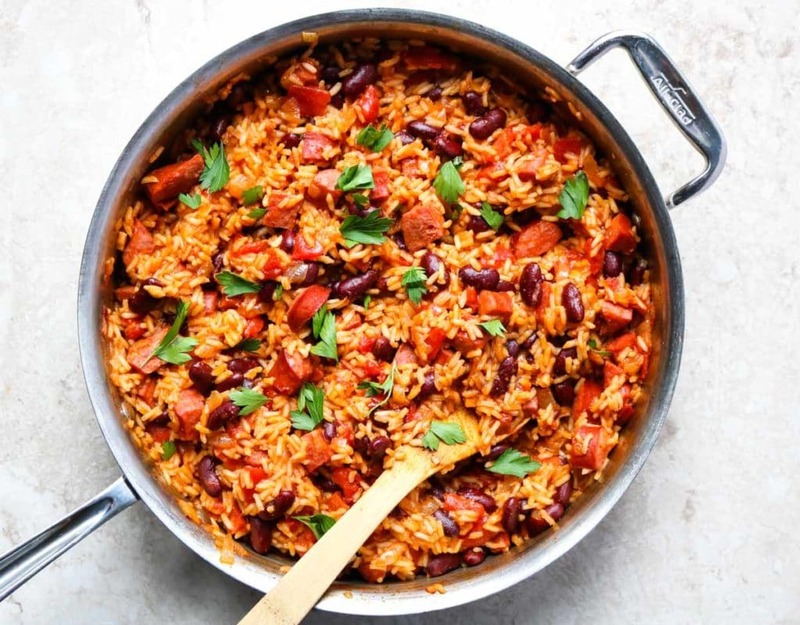 Skillet Dirty Rice & Beans is a super easy skillet dinner, made in one pan. 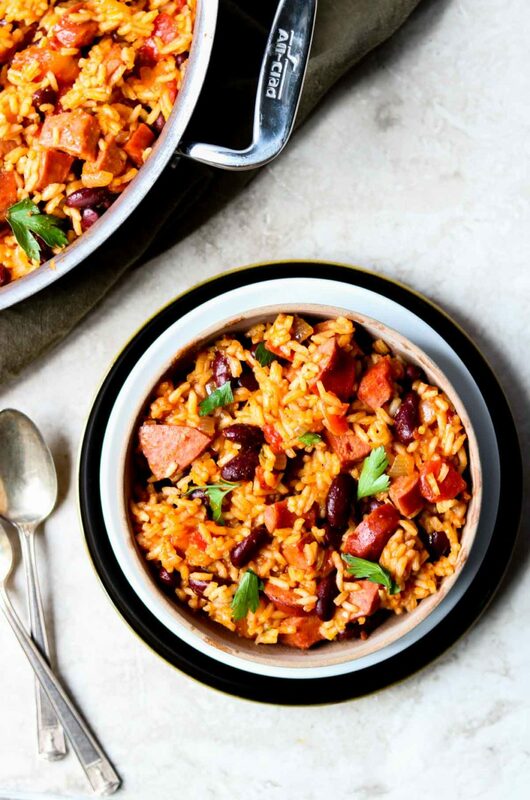 The rice is cooked with warm aromatics like onions, garlic, Cajun seasoning, and smoked paprika. Then you add diced tomatoes, chicken broth, and smoked beef sausage. Finally the kidney beans get added and you are left with a delicious dinner that is cooks in under 30 minutes, without a watchful eye. This is not a spicy dish, it is simply full of warm and comforting flavors. Of course, you can make it spicy by adding extra red pepper flakes or cayenne pepper. I love a one pan dinner. There is nothing better than finishing dinner and only having one pan to wash. 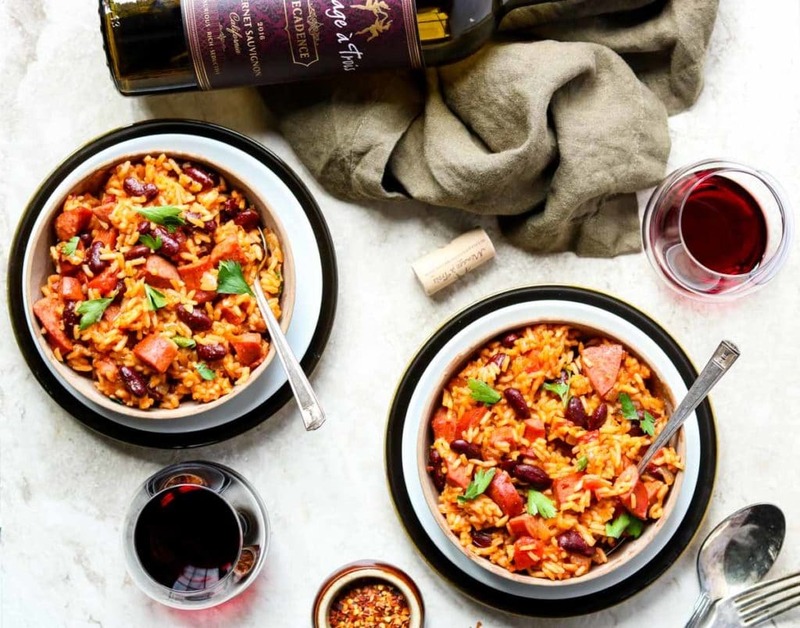 This one skillet dinner is great on a night when you are busy and just want to be able to throw dinner in a pot and get on with your night. 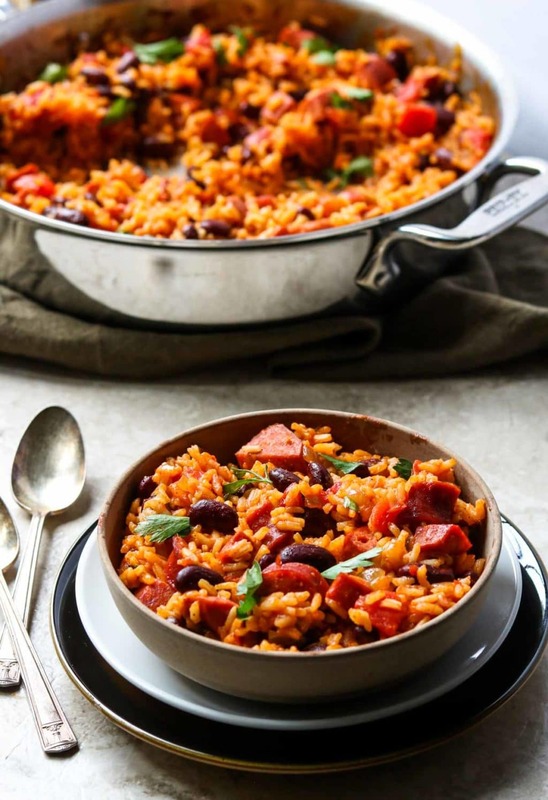 Some of our other favorite one pan dinners are my Healthy Sheet Pan Sausage & Veggies with Smoked Paprika Vinaigrette or my Instant Pot Cajun Rice with Chicken & Sausage. What Makes Dirty Rice, Dirty? I actually had to look this up when I thought about this recipe. So I thought I provide the information right here on Mom’s Dinner. 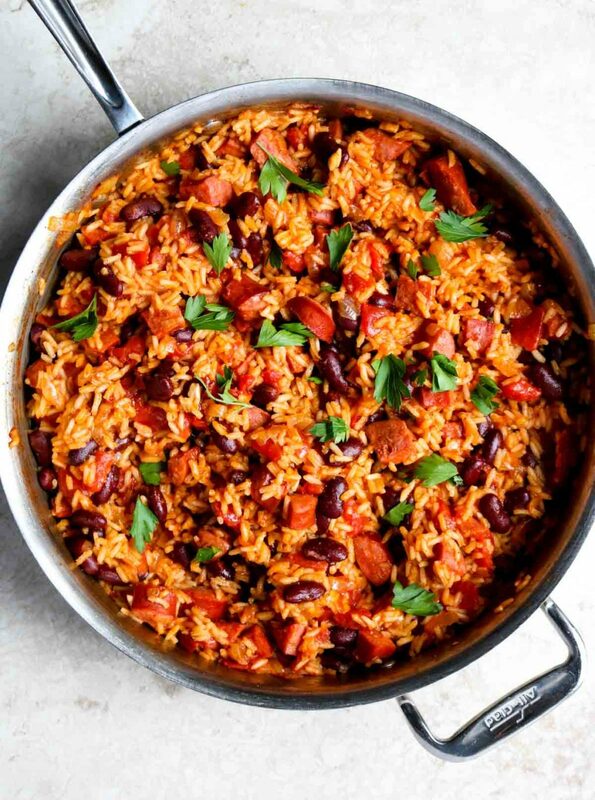 What I found is that Dirty Rice is called dirty because when white rice is cooked with all the Cajun and Creole spices the rice takes on a dirty appearance. I like to use Louisiana Fish Fry Cajun Seasoning in this recipe.. and all my Cajun style recipes. It has a great mix of spices and salt. Now if you choose to use a different Cajun seasoning check and see if it contains salt. If it does not, add a little less than 1/2 tsp of salt when you add the other seasonings to the onion-sausage mixture. Then wait to taste for additional salt at the end. This is a great set it and forget it recipe. Once all the ingredients are in the pot you have about 20-25 minutes to leave the kitchen and get other things done. In a large skillet with a lid heat the olive oil over medium heat. Add the onions and garlic to the pan and saute for about 5 minutes. While the onions and garlic saute chop the sausage into a dice, about the size of a kidney bean. Toss that into the skillet. Add all the seasonings and stir to coat the onions and sausage. Pour the chicken broth and tomatoes into the skillet and scrape up any browned bits from the bottom of the pan. Now add the rice and bring the heat up to medium high and let the liquid come to a hard simmer. Lower the heat to low and pop the lid on. Simmer on low for 18-20 minutes. Remove the pot from the heat and let it sit, with the lid on for 5 minutes. Stir in the kidney beans and it is time to eat! This is meant to be an easy dinner without a lot of sides. The recipes contains your starch, protein, and veggies (if you consider beans and tomatoes veggies?!). So I would simply serve this with a big glass of milk, bottle of beer, or glass of wine. 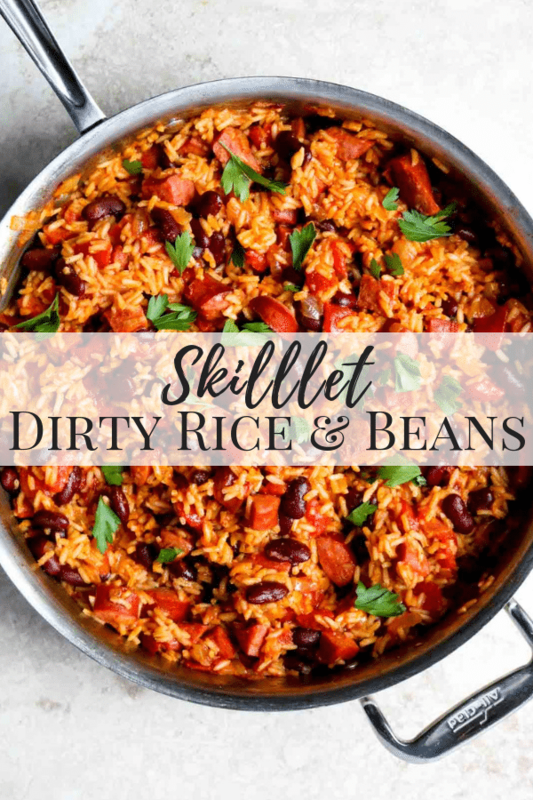 I hope you give this recipe for Skillet Dirty Rice & Beans a try in your kitchen! 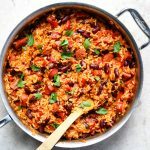 Skillet Dirty Rice & Beans is a one pan dinner that is easy to make and full of Cajun flavors and spices. In a large skillet with a lid heat the oil over medium heat. Saute the onions and garlic for about 5 minutes, stirring often. Add the diced sausage and give a stir or two. Sprinkle in all the seasonings and spices. Stir to coat the onions and sausage. Pour the chicken broth and tomatoes into the pot and scrape up and browned bits from the bottom of the pot. Turn the heat to medium high and bring the liquid to a hard simmer for a minute. Turn the heat to low and pop the lid on the pot. Cook for 18-20 minutes. Remove the pot from the burner and let sit, with the lid on, for 5 minutes. Stir the bean into the mixture and serve. 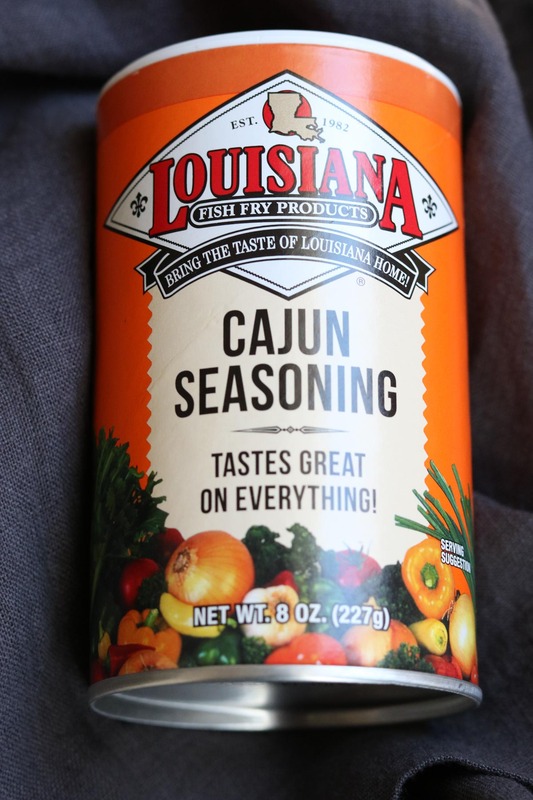 **If you use a different Cajun seasoning that does not contain salt, add a little less than 1/2 tsp salt when you add the other seasonings to the onion-sausage mixture. For extra heat add a dash or two of cayenne pepper. I have literally eaten this for at least one meal for the past three days. It is extremely hard to stop eating it! SO GOOD!!! I love cajun dishes like this. They have so much flavor and are the perfect comfort food. Great recipe Susie!! Great! I think it is gluten free?! Let me know how it turns out. Susie my stomach is growling looking at these photos! YUM! 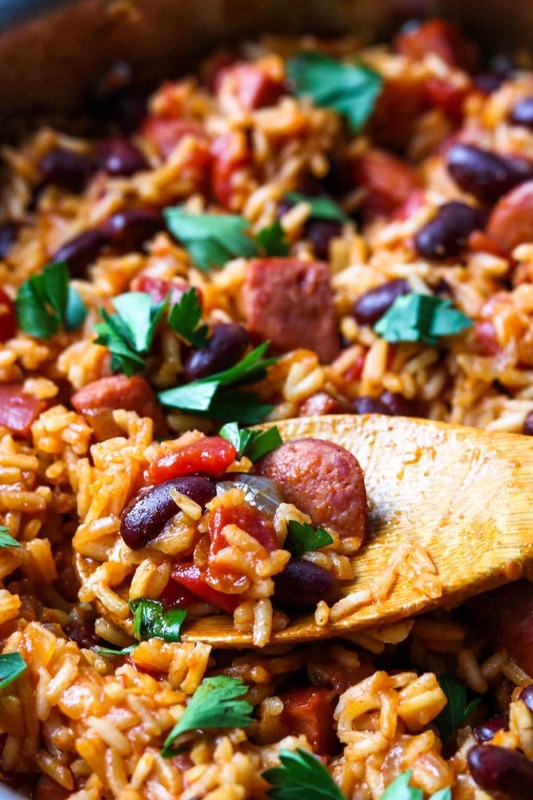 You know this southern girl loves some rice and beans! This looks delicious! Yes!! Definitely give it a try. My oldest loves anything Cajun. Need to make this for her ASAP! She will love this then! It isn’t spicy, just super flavorful. Sounds delicious, will have to make it asap! Please do! Let me know how it turns out for you.